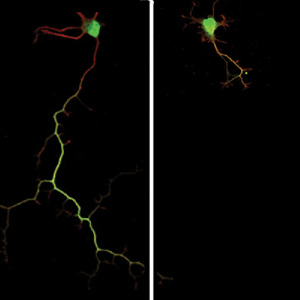 An inherited tumor disorder known as neurofibromatosis 1 shortens branches (right) of the brain cells that make the important neurotransmitter dopamine. In a new study, researchers show that this decrease in dopamine impairs the hippocampus, a brain area critical for learning and memory. The disorder, neurofibromatosis 1 (NF1), is among the most common inherited pediatric brain cancer syndromes. Children born with NF1 can develop low-grade brain tumors, but their most common problems are learning and attention difficulties. The study appears online in Annals of Neurology. According to Gutmann, who is director of the Washington University Neurofibromatosis Center, scientists are divided when considering the basis for NF1-associated learning abnormalities and attention deficits. Mutations in the Nf1 gene can disrupt normal regulation of an important protein called RAS in the hippocampus, a brain region critical for learning. Initial work from other investigators had shown that increased RAS activity due to defective Nf1 gene function impairs memory and attention in some Nf1 mouse models. However, earlier studies by Gutmann and collaborator David F. Wozniak, PhD, research professor in psychiatry, showed that a mutation in the Nf1 gene lowers levels of dopamine, a neurotransmitter involved in attention. In this Nf1 mouse model, Gutmann and his colleagues found that the branches of dopamine-producing nerve cells were unusually short, limiting their ability to make and distribute dopamine and leading to reduced attention in those mice. The new research suggests that both sides may be right. In the latest study, postdoctoral fellow Kelly Diggs-Andrews, PhD, found that the branches of dopamine-producing nerve cells that normally extend into the hippocampus are shorter in Nf1 mice. As a result, dopamine levels are lower in that part of the brain. Charles F. Zorumski, MD, the Samuel B. Guze Professor and head of the Department of Psychiatry, showed that the low dopamine levels disrupts the ability of nerve cells in the hippocampus to modulate the way they communicate with each other. These communication adjustments are a primary way the brain creates memories. Researchers then found that giving Nf1 mice L-DOPA, which increases dopamine levels, restored their nerve cell branch lengths to normal and corrected the hippocampal communication defect. L-DOPA also eliminated the memory and learning deficits in these mice. To customize patient therapy, Gutmann and his colleagues are now working to develop ways to quantify the contributions of dopamine and RAS to NF1-related learning disorders. Diggs-Andrews KA, Tokuda K, Izumi Y, Zorumski CF, Wozniak DF, Gutmann DH. Dopamine deficiency underlies learning deficits in neurofibromatosis-1 mice. Ann Neurol. 2012 Oct 30. This work was funded by grants from the Department of Defense and National Cancer Institute.